Along with the rest of the world we are shocked and horrified at the massacre of unarmed men, women and children at the Al-Noor and Linwood Mosques in New Zealand. We condemn the hatred and intolerance that led to such a despicable act and we stand in solidarity with our Muslim brothers and sisters, offering our prayers and love to the familes of those killed and injured by such senseless violence. We unite with people of all faiths to promote peace, understanding and tolerance in all of our communities. 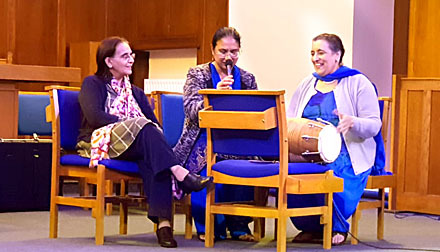 On Wednesday 15th November 2018, Solihull Faiths Forum staged a concert at Solihull Methodist Church to commemorate the centenary of the end of World War One. Entitled ‘From Battles to Brotherhood – One Hundred Years on’, the concert is being staged by Solihull’s churches and faith groups. The evening commenced with networking over a finger buffet before the concert commenced in the presence of the Mayor of Solihull, Councillor Flo Nash. In a programme lasting almost 90 minutes, the war was recalled and peace celebrated in a combination of music, words (sung and spoken) and dance. On Tuesday 7th August 2018, the Government’s Minister for Faith, Lord Bourne, chose to pay a visit to Solihull to meet with members of the Solihull Faiths Forum and discuss the work of bringing people of different faiths and backgrounds together. 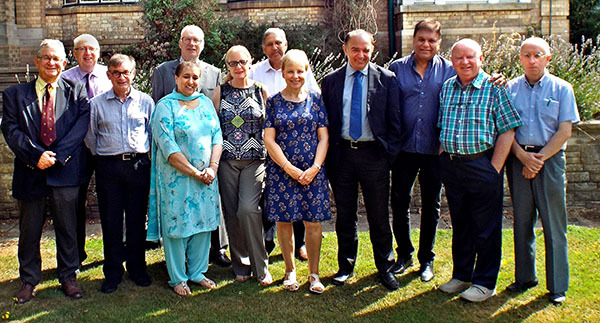 The meeting was attended by representatives of nine of the borough’s faith communities, who joined the Minister in conversation for an hour at the meeting hosted by the Missionary Society of St. Columban in Widney Manor Road. The Minister heard of the history of the Forum, founded in 2006, and its work in maintaining dialogue between faith communities and hosting events aimed at developing greater mutual understanding. He described the meeting as ‘positive, effective and informative’. Lord Bourne took the opportunity to explain the Government’s Integration Green Paper, which sets out a vision of Britain where people, whatever their background, live, work, learn and socialise together in their communities. This vision is based on shared rights, responsibilities and opportunities, a vision which is shared by the Forum. Our 2018 AGM was held on Monday 18th June 2018 at The Hub, Touchwood Shopping Centre. The meeting began was light refreshments at 6pm, with the formal business meeting, inclusive of Chair’s presentation of the Annual Report and of the Steering Group appointments, commencing at 6.30pm. Following this our Guest Speaker was Alison McGrory, Assistant Director, Stronger Communities and Partnerships, Solihull Council. Her focus was ‘Stronger Communities and Social Action’. The meeting was closed with encouraging words from the Mayor of Solihull, Councillor Flo Nash, who had been pleased top hear of the work of the Forum during the meeting. 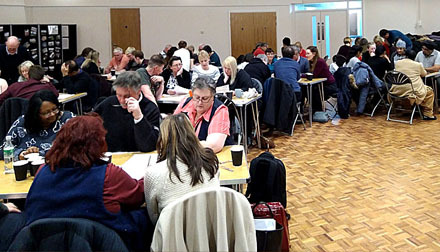 On Wednesday 7th February 2018 fifty eight contestants in ten teams gathered at the Three Trees Community Centre, Chelmsley Wood Baptist Church, to pit their wits against each other for a World Interfaith Harmony Week Quiz Night. They tackled a hundred varied questions mixing traditional quiz themes such as history, sports and arts with a smattering of faith based questions all with an international flavour, leaving no continent and no major faith unvisited during two hours of testing challenge, interrupted only by a break for fellowship and a fish’n’chip or veggie burger supper. The evening concluded with a win for a team that joined the forces of four of the Forum’s partners in Solihull Council with two of our Hindu members. As usual, few were in a rush to go home. Conversation continued, more friendships were sealed and folk left with a consensus that ‘we must do this again’.